It would be naive to assume that disasters will stop. We cannot change the nature of disasters. What we can change, certainly control, is the scale that a disaster wreaks. This is precisely what disaster preparedness -- a mouthful in the abstract, a cataclysm as sudden and neutral as death itself -- is about. Disasters can retail death only when the response to it is lazy, that is to say, unplanned. This is why disasters have to be planned for, actively encountered, not only at the level of policy (of which India has seen enough already, in the last five years) but also, and specifically, at where it hits hardest: people affected. Affected because they were not informed. Affected because they had no idea that a calamity -- it could be the ground shaking, or a rolling sea driven through coasts, powered by a mad wind, or even a jet plane wall of water -- was about to slam into and turn their lives upside down. Affected because a machinery busily whirring to only reproduce itself day after administered day never factored them in in its positivist mathesis. Yes, disaster management begins with the communities that live and eke out their living in areas -- seismic zones, on the coast now bereft of mangrove bufferage -- disasters can seize and toy with in their dread grasp. For this very reason, disaster management is about science: about the tremor a needle records, about conclusions drawn on the basis of a bizarre recording on a fancy, expensive instrument, about this information being effectively transmitted -- a gory forewarning, but one that nevertheless forearms. It is one thing for science to cook up a nuclear bomb -- the provocation here is negative, for this bomb presumes an implacable enemy. Indian scientists have done this. Yet they have never possessed the humility -- social as well as methodological -- to gear their intelligence towards the simple realisation that when disasters occur, it is the poor that actually get devastated. 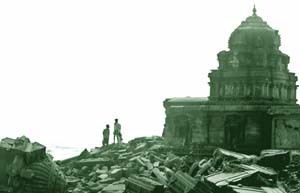 It is not usual to point out that the real victim of the tsunami -- like that of the Orissa cyclone or the Bhuj earthquake -- is Indian science, and, to the extent that the State controls research, actually the Indian State. It is also not usual to point out that the tsunami is a blessing: it has revealed the extent to which India's scientists are isolated from its people. But it is possible that now they will invest in the affected, only for the future. And it is imperative that our administrators take up seriously the fact that disasters hurt less when planned beforehand, monetarily. It's not that difficult, really. The systems are all in place. A disaster preparedness committee that's recommended several procedures, the cmg to initiate action on information received, the imd to track climatic events and disseminate the information flow. But so far, we still don't seem to be able to meet disaster with any success. Isn't it time to change? Only the next disaster will tell. Story anchored by Richard Mahapatra. Contributors: T V Jayan, Ritu Gupta.